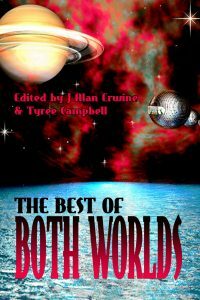 My Buddhism-in-the-future story, The Tulku of Titan, is now available again in print as part of the Nomadic Delirium Press and Alban Lake Press co-produced anthology, The Best of Both Worlds. Click here to access the relevant page on the Nomadic Delirium site to purchase the book or to learn more about it. The book, edited by Tyree Cambpell and J Alan Erwine, is also available on all the usual book-ordering sites, such as Amazon and Smashwords. This story is the first of the Titanville tales, and the second installment – The Terror of Titan – is still available as an e-book through Nomadic delirium. Click here for more details about The Terror of Titan, an off-kilter look at murder in the unrelentingly hostile environment of deep space. I hope you enjoy these Titanville tales. I certainly hope to have more of them published in the future!